Yesterday morning I awoke with a feeling of trepidation. I think I was nervous. I wasn’t sure what to expect.. I drove over the river (or I should say over the railroad tracks, I’ve never seen so many tracks crossing the highway anywhere else) and through the deep dark woods of WI to take the kids to see grandma (my mother-in-law Martha). She didn’t make it over for Thanksgivng. In fact, she has gotten to the point where she is no longer eating much more than applesauce. For years, my son Alex and my husband Paul joined Paul’s stepdad Darryl to hunt. For the last couple of years, Martha would come to my house and spend the weekend playing cards, working puzzles, and watching movies. But she is too sick to go anywhere now. She has stage 4 terminal cancer. The chemo stopped working and the cancer has spread. The guys have been visiting her the last couple of weekends, but I haven’t had the chance to visit for awhile. I felt that it was important to take Angel out to see her while she was home from college for a few days. Will it be the last time? I was afraid. Afraid of what I would find. Paul has been coming home upset from his time spent there. He didn’t know why. Then after awhile, he said that it was horrible seeing his mother die. So I was afraid. My stomach felt upset. Would she be in great pain? Would she forget my name like the last time I visited. It’s hard to see someone who was once so vibrant and full of life fade away. She lost over 50 lbs and is just skin and bones. Her hair is starting to grow back in a brown patch of fuzz, so different from her black curly long hair she once had. Her gait is slow, she aged 20 years in a year. She was happy to see us. I was able to sneak away for awhile to see the deer stands. In all these years, I have never seen where they hunt. In all those years, they only got one buck. To think just this last week we awoke to find a deer delivered to the end of our driveway, but the meat was not salvageable. Regardless, if they don’t bring back a buck, every year they bring back a Christmas tree. 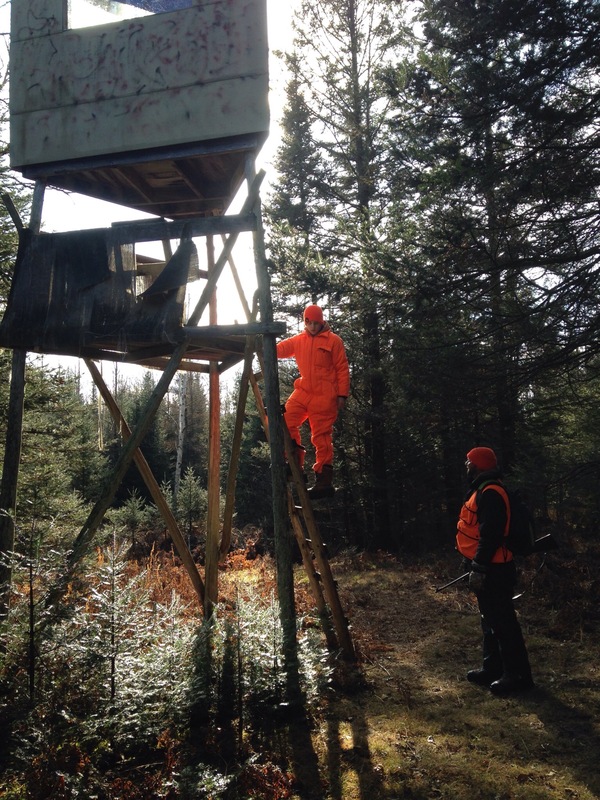 I had to show you a picture of Alex and Paul at Alex’s tree stand. Our visit with Martha went better than the girls and I expected. Martha is such an unrealistic optimist that I think she makes herself feel better. She kept talking about the day that she will get better and be able to come over to visit. That day will never come, but maybe it is better that she believes it. It was nice to see her so upbeat and not have to see her suffer. The thought of watching a loved one suffer is unbearable. I dropped Angel off and came home to a glorious blue Christmas tree. I am excited for the beginning of the next holiday season. A time of hope and light. A time of such intense busyness that I forget all of my troubles.. I am going to decorate my tree tonight..